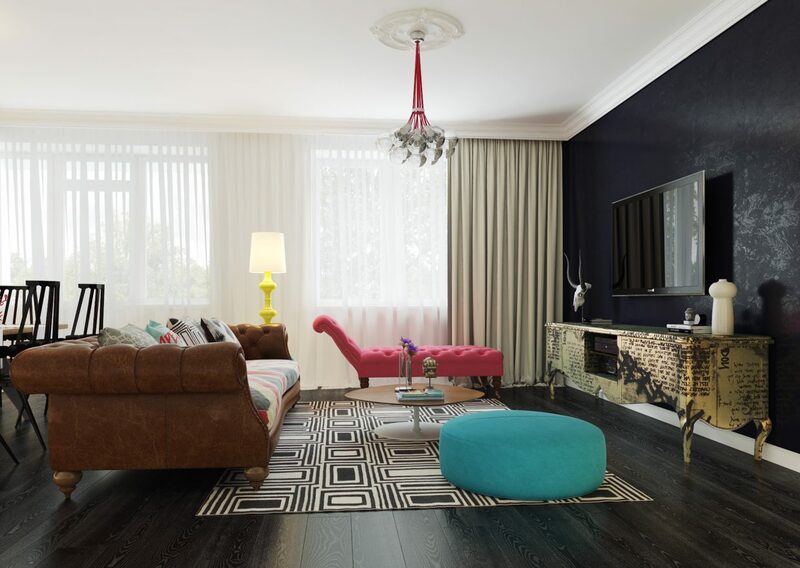 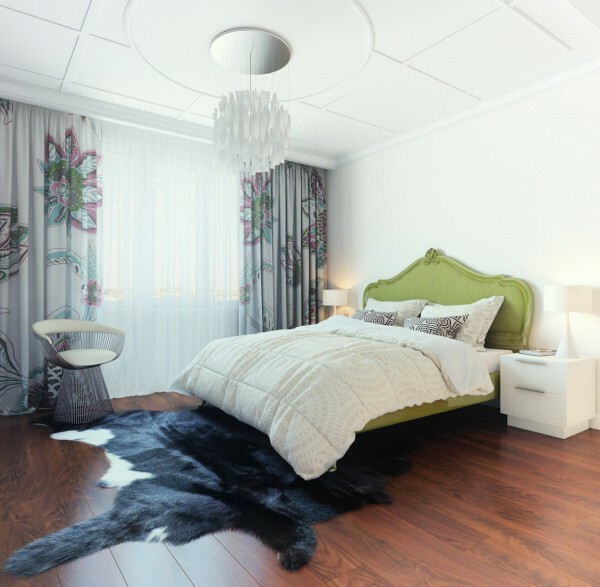 Russian designer and CG artist Dmitriy Schuka is making pop art modern with his colorful, bold interior design. 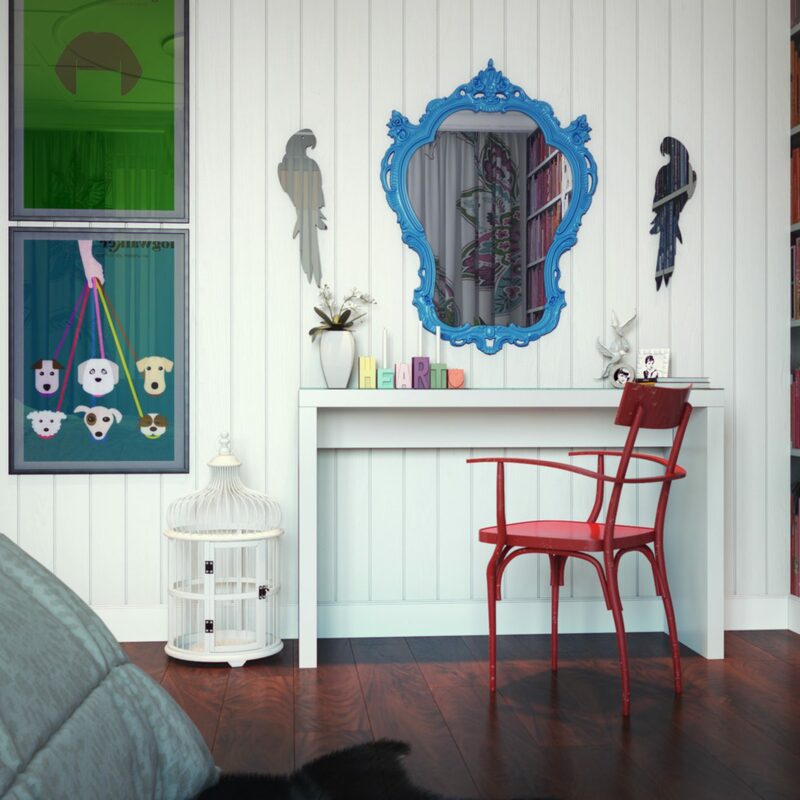 He took this standard home and turned it into a show piece with colorful furnishings, bright wall paint, and pop art pieces that take you back in time. 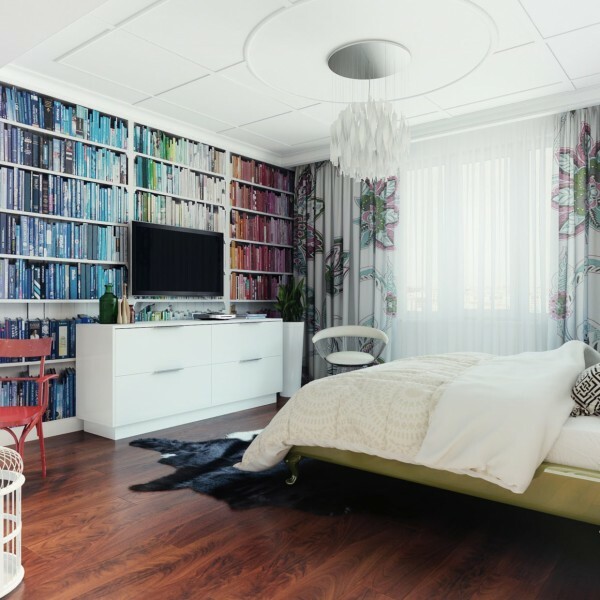 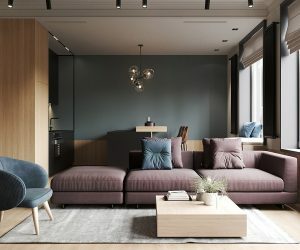 It isn’t a common design scheme for sure, but it is a unique way to make your home really stand out and if you’re a fan of pop art, this is a way to incorporate that love without overpowering the home. The living room has rich, dark floors and the wall colors contrast with a simple white and a dark blue accent walls. 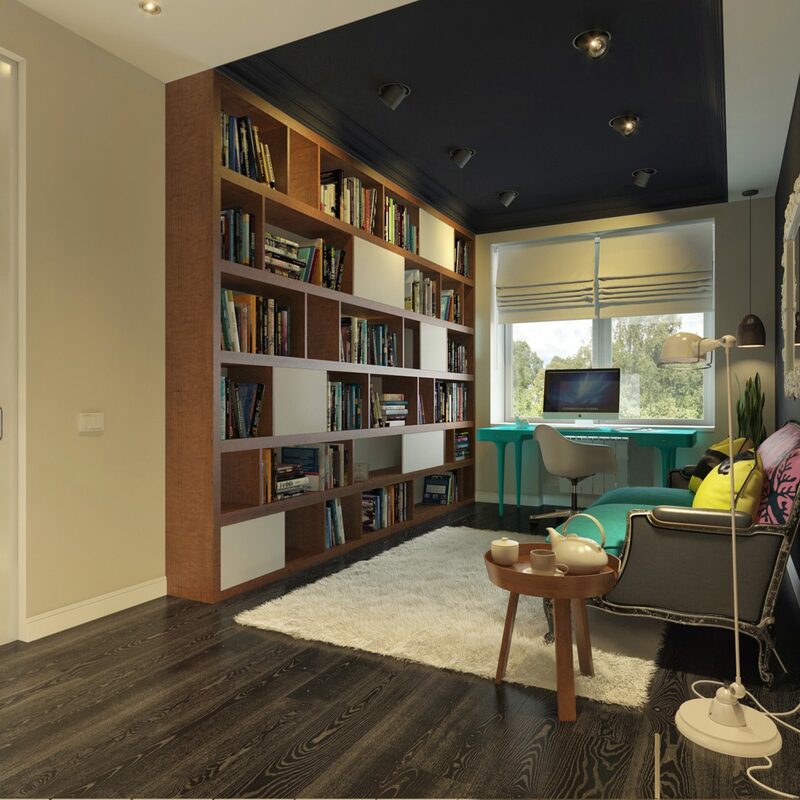 A wall of floor to ceiling windows brightens up the space so the dark wall doesn’t seem so daunting. 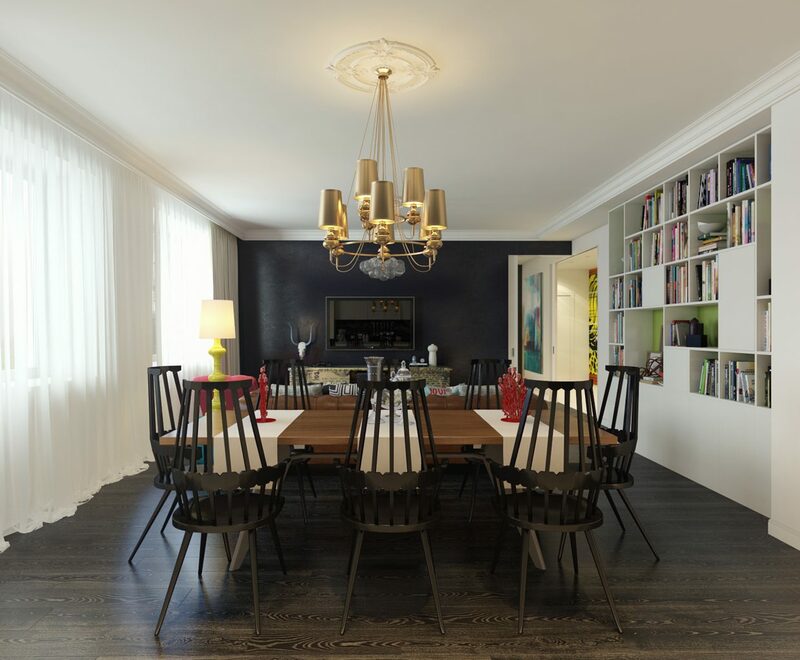 The space is an open concept with the dining and kitchen to the rear of the living room. 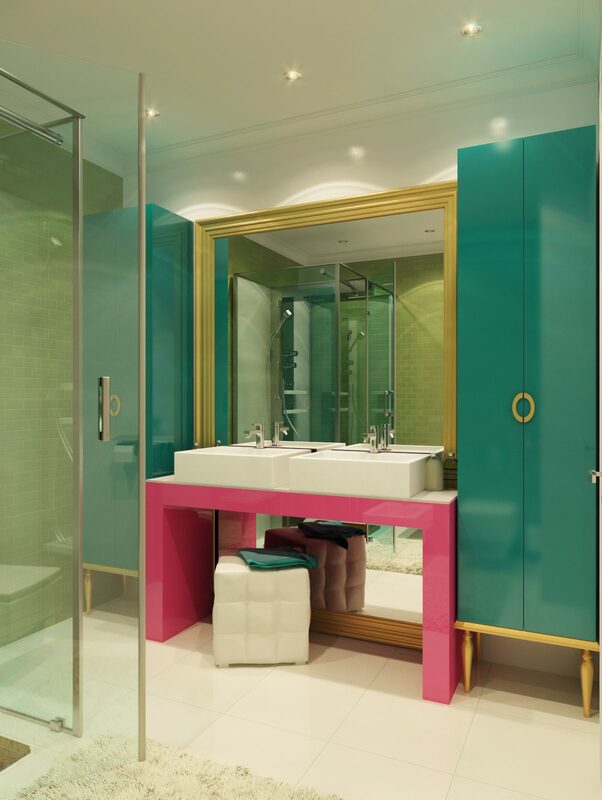 The space pops with colorful furniture in bright turquoise and hot pink. 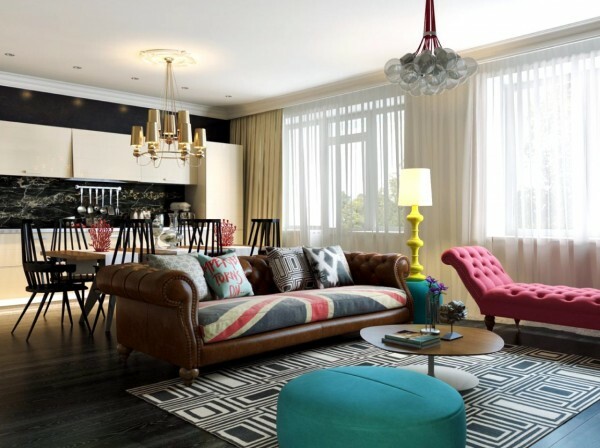 The couch is a conversation piece as the fabric is of the flag of Great Britain. 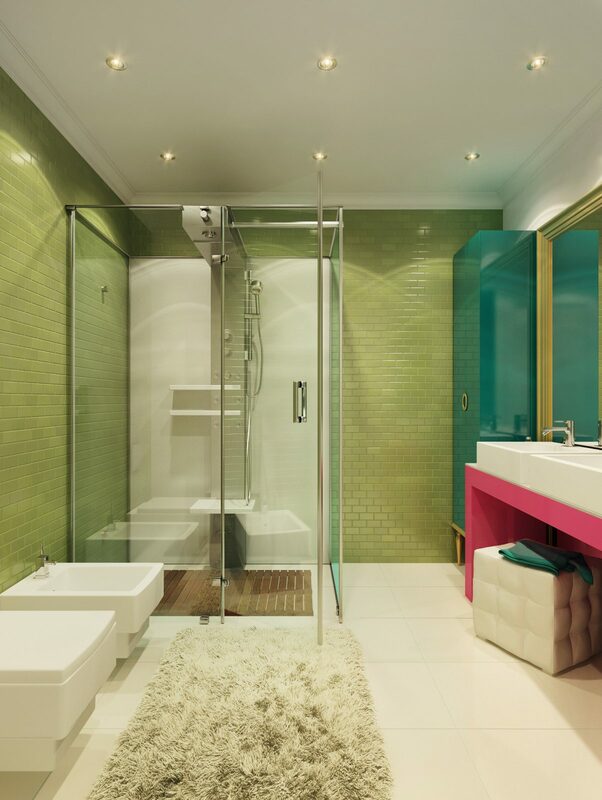 The built-in shelving has a lime green back splash color and the chandelier is also hot pink adding more pop to the space. 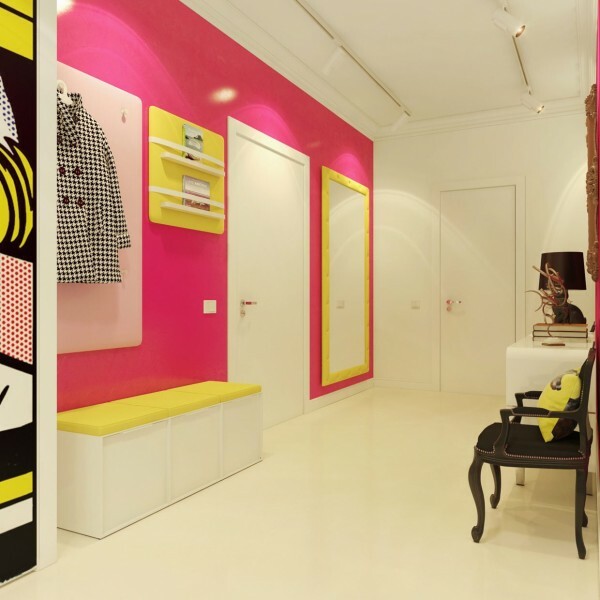 As you can see through the photos, the pop art design is carried throughout the home in the bedroom, bathroom, foyer, and office space. 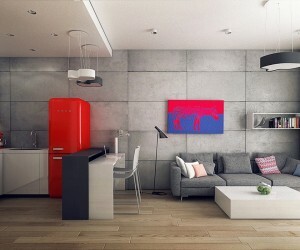 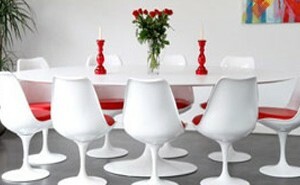 Each room has that intense color splash in the art or furniture. 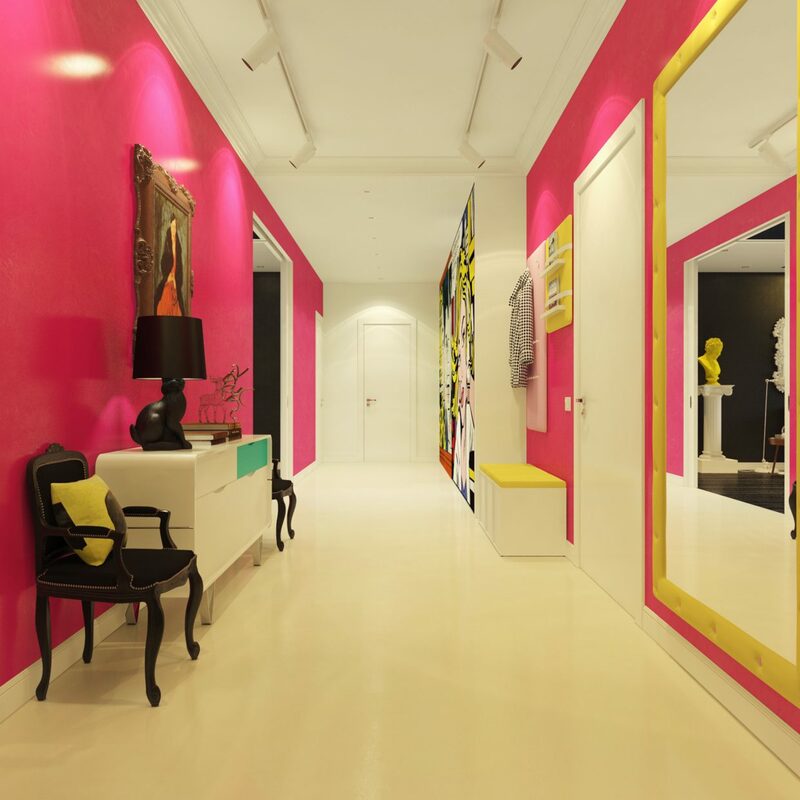 The foyer is by far the brightest in the home with hot pink walls and a wall sized pop art painting that commands the space. You can’t help but stop and stare at this piece. 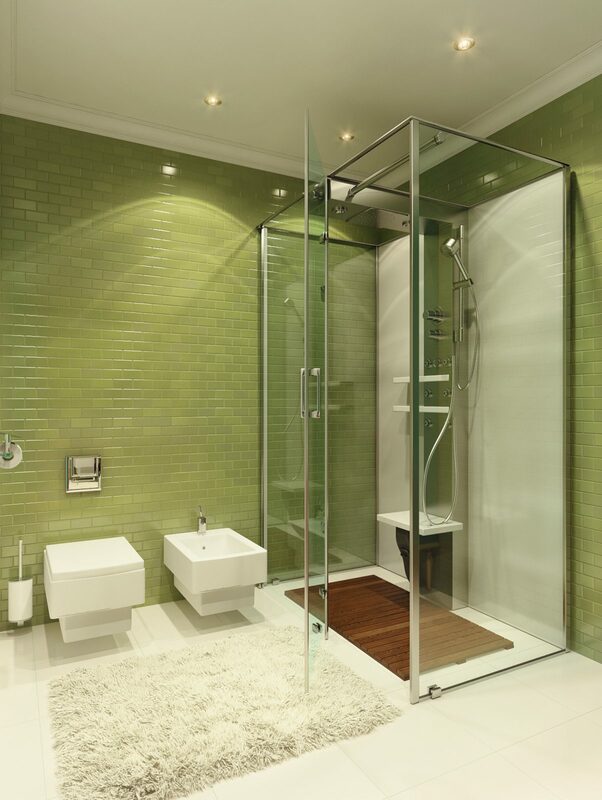 The bathroom is very bright with lime green tiles filling the room. This home is very cohesive in the design and layout. 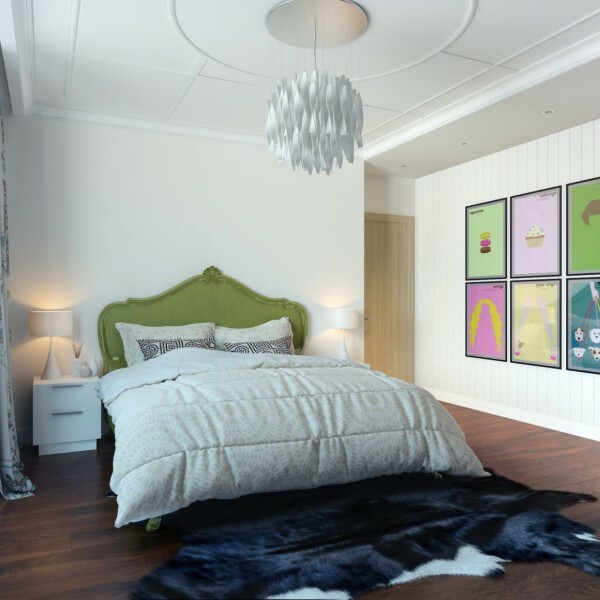 Many rooms have dark hardwood but the spaces are lighter with the bright furniture and art. Those touches of pop art flare create a design that is perfect for someone who wants to take a risk and do something totally different in their home.